Discussion in 'Progress/Execution Threads' started by JCS, Aug 30, 2018. Are you ready to make some F*cking money? So there I am, faced with a choice. I’m with clients at the time, 30 hours a week. They offer me full time at 40 - 50 hours a week. Huge pay raise, double what I was making. More money than I’d ever seen in my life. I couldn’t justify giving all of my time away to someone else. I have too much ambition, too much drive, too much sickening, almost delusional levels of self belief. So I left, right then and there. So what did I do? I brainstormed, and then I brainstormed some more. You see, I’m a bit of a productivity nerd. And I love Science Fiction. I get kind of excited when I start to think about the tools we have access to on a daily basis. Suddenly you have a fully synced, systematically superior machine with multi-million dollar potential. Long story short? I’ve been building a process over the course of a few years. And I succeeded. Ohhhh, did I ever. 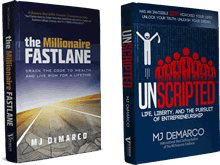 So much so that I built this system into a course… and started selling it. Yesterday, as a matter of fact. And do you want to know my results within the first week…? $2.7K in the first week of sales. So now…? Now, I’m hungry. How do I get there? 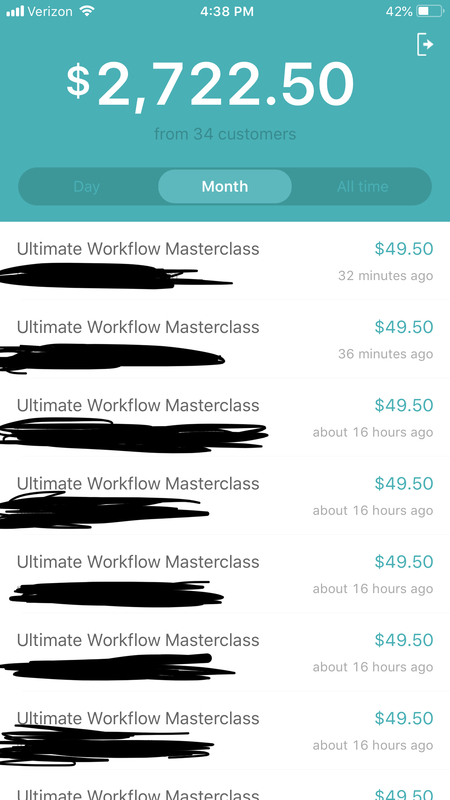 The course is selling for $99 (the screenshot was a 50% off flash sale I ran yesterday… you can see the results). 1. Contact as many relevant Twitter influencers, Facebook Pages, Instagram influencers, You-tubers, and bloggers as I can relevant to my niche and offer them a 50% commission for selling my product. So far, this strategy has been working wonders. Eventually I’d like to sell the system to large companies via consultation for substantially bigger bucks, but $1000/day seems like a totally feasible goal right now. I’m excited to document the journey. I’m excited for you to come with me. Now lets make some F*cking money. ChrisR, Karume, BVosqe and 15 others like this. Congratulations! 2k in a week. Wow. Keep going. Thank you very much! It's been a lot of fun thus far but there's still a lot of work to be done in order to hit that $1K/day goal. So I did this 50% off flash sale on Twitter last night. Made $500 in less than 2 hours. Went over really well, definitely something worth doing again. But this morning, I get an email right? Dude says he was 7 shots deep last night, bought the masterclass in a drunken haze, wants a refund. I say sure, no problem - everyone makes mistakes after all. But then I'm sitting there like... "damn... I don't like losing the sale..."
Offered another 50% off to two more people. Doubled my loss in less than 30 minutes. Whenever you take an L, always strive for 2 more W's. Do this regularly enough, and you'll for sure get ahead. ChrisR, rogue synthetic, Karume and 4 others like this. Soon, definitely will be putting my product up on clickbank and other affiliate networks in the very near future. Have you gotten any feedback from students yet? Are they referring friends, posting reviews, etc? That's the first thing I would try to work on, personally. Maximize the value THEY get so that they market your course to others for free. Not that affiliates are a bad idea, but you want to multiply your efforts, use quality as a lever. Karume, Readerly, BrooklynHustle and 2 others like this. I was actually walking people through the system my course teaches for free before I ever even made it. That's how I got my first round of affiliates. So far, all reviews have been great - I'm even starting to message some people who would be good fits as affiliates and I'm getting "oh yeah, I heard good things about this!" as a response. Karume, BrooklynHustle, Gepi and 1 other person like this. I've made three sales since I last posted. All were from affiliates, but still... An extra $150 is still awesome. Karume and Gepi like this. Yesssss.... this. Developing this way from the start pays off. The product will be better for it, and I imagine the affiliates will be more genuine. Karume, JCS, BrooklynHustle and 1 other person like this. where the mods closed the exact same thread for being nothing more than a sales pitch. I am curious, what is your response to that? Your first post reads like copy, but maybe you are planning to share more about your journey which people may find interesting, and educational. JCS and f0reclone like this. Of course! The negative feedback helps me improve after all. Yes, I originally posted this Journey thread on BHW. It wasn’t my intention for the thread to be considered a sales pitch - I genuinely just wanted a place to track my progress and, as you said, share with others who might find it educational. I tried to plead with the MOD that closed the original thread, asking if there was anyway I could either go back and edit out whatever was causing issues or AT THE VERY LEAST create a new Journey thread and be more careful with the language. So I left, and moved the thread here. And with that being said: If there are ANY mods that, for whatever reason, have an issue with this thread - I’m more than willing to comply with whatever it takes to make sure it can remain active. Woke up to a few more sales today. A few of them were through bundle deals with a few other people’s products and then some other affiliates. Guys, if you’re looking to do affiliate marketing with your product or service as well... provide the value up front. You’ll receive a better response rate and come out the gate with a certain degree of authority and respect - which truly could mean all the difference. Good thing this is a journey thread to be making $1K PROFIT a day. Also, I gotta be doing it consistently... or what's the point right? Is this your own product and did you write it yourself? Or affiliate? But nice stats! 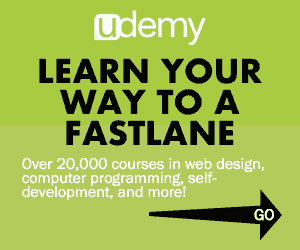 Is the course hosted on your own site or are you using a marketplace? Thanks! And it's my own course - I created it myself. I will be getting on Clickbank in the near future as well. I’m guessing the course is based on your own method that you decided to share and sell. Another example of leveraging your high ground! Karume and JCS like this. So I've never heard of Gumroad before. What exactly can it do? I looked on their website and they have limited detail about it's potential. It's just for hosting products and services. I like it so far, pretty intuitive stuff. Slowest day since launch today. Low views on my page and no sales so far. 1. Double down on twitter. I'm helping my girlfriend move this weekend but Twitter is where the majority of my sales are coming from, either through me directly or affiliates, so gotta make sure that I just go hard as I can each day so I can continue to get that $$$. Karume and NFT like this. 3. FB ads. These will be a huge money maker if I can hit the sweet spot with them... thinking about hiring someone to do them for me (even though there's value in learning them myself... results won't be as immediate). 4. Keep reaching out to potential affiliates. This has served me well thus far, so have to make sure I continue. If you guys have any advice or suggestion, I'd love to hear them. Want to optimize as much as possible so I can have a strong second week. I have made no sales in the past 2 days. But that's OKAY. I'm not worried. It's Labor Day weekend here in the states, so I'm not surprised that things have been slow. But this coming week, I plan on killing it all over again. Good news - I reached out to two Youtube channels that got back to me and are both very interested in being affiliates for my product. The first one has about 52K subscribers and gets, on average, about 3K views per video. Their entire channel is based on productivity, so their audience is a perfect fit. The second one has over 200K subs and averages something like 50K views per video. He's more of a "I can show you how to make money online" type of guy - but still, his audience would most likely to very well for me. In the meantime I'll still be churning out the follow ups, initial outreach, and get my product on Clickbank. I also have some already confirmed affiliates that have bigger following (mostly across twitter) and dedicated audiences that have yet to start pushing yet - but once they do, volume will explode. Lesson - Don't let the slow or 0 days discourage you, they have to happen. You can't kill it everyday, but if you stay persistent you'll continue to see results. Karume, NFT and bytecode like this. Hi there, thanks for sharing your journey - congrats on your success to date! Do you have any tips/suggestions on how to do product creation?